A request for a lunch-hour haircut has turned into a battle over human rights, pitting freedom of religion against a woman’s right not to be denied service based on her gender. Faith McGregor walked into the Terminal Barber Shop on Bay St. in June to get a haircut — the “businessman,” short on the sides, tapered, trim the top. The shop, like many barbers in Toronto, doesn’t do women’s haircuts. But McGregor, 35, said she wanted a men’s cut. Shop co-owner Omar Mahrouk told her his Muslim faith prohibits him from touching a woman who is not a member of his family. All the other barbers said the same thing. “For me it was just a haircut and started out about me being a woman. Now we’re talking about religion versus gender versus human rights and businesses in Ontario,” said McGregor. She filed a complaint with the Human Rights Tribunal of Ontario almost immediately, saying she felt like a “second-class citizen.” Mahrouk’s response to the tribunal, provided through his lawyer David Kolinsky, doesn’t dispute McGregor’s complaint but says being forced to cut a woman’s hair would violate his freedom of religion. “We live for our values. We are people who have values and we hold on to it. I am not going to change what the faith has stated to us to do. This is not extreme — this is just a basic value that we follow,” said Karim Saaden, co-owner of the Terminal Barber Shop. He noted that it was a matter of adherence to faith, not a gender issue. “In our faith, for instance, I can cut my mother’s hair, I can cut my sister’s hair, I can cut my wife’s hair, my daughter’s hair,” said Saaden. The barbershop suggested a solution to McGregor toward the end of August, offering her a haircut from a barber willing to do so. “It’s the principle of the matter so I turned down their lawyer’s offer and said, ‘No, I wish to continue with the tribunal,’ because this needs to be discussed and now it’s bigger than what occurred with me that one day, in one afternoon,” said McGregor. 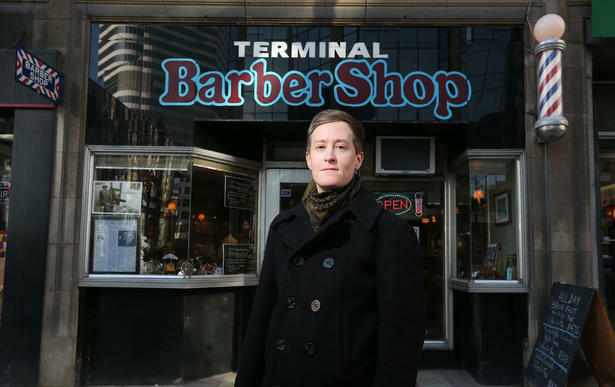 She is asking the tribunal to force Terminal Barber Shop to offer its men’s haircuts to both genders, and suggests in her application that the shop post a sign indicating it serves both men and women. She is not seeking money. The matter is one in an increasing number of “competing rights” cases seen by the Human Rights Tribunal, said Pascale Demers, a spokesman for the Ontario Human Rights Commission, which studies and develops rights policies. The term refers to a situation where two individuals have a right, but there’s a conflict when both exercise it. “There’s no hierarchy of rights under the legislation, so it’s not about one right necessarily trumping the other. It’s about looking at the facts of the case,” said Demers. There is slim precedent in the area, said Demers, and this case could set an important one. “It’s useful because, as you know, Ontario’s population is increasingly diverse and these things are bound to happen.” In addition to discussing religious freedom, Mahrouk’s response expresses concern that the complaint will force the shop to train its barbers to cut and style women’s hair, which is outside their skill set. “I know that there is more money to make in hair salons for women than barbershops but because we’ve been barbers for so long, we chose to take over the business as barbershops and that is why we don’t cater to women,” said Saaden. The parties will first try mediation, scheduled for next February. If that fails, an adjudicator will decide the outcome of the case.